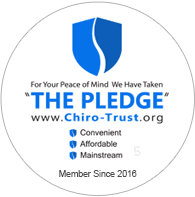 Chiropractors perform 95 percent of all adjustments in the world to correct the chiropractic subluxations, somatic dysfunctions, or joint dysfunctions of the vertebrae joints of the spine. The adjustments also work well on all of the other parts as well. Chiropractic adjustments are performed by applying gentle, yet firm pressure to a bone. The goal of any adjustment is to restore primarily joint function and sometimes position. When a joint is functioning normally, it allows the nerves that supply the joint to send normal signals to the brain and spinal cord. Signals are then sent back out to the muscles telling them how tight they need to be. Most adjustments are performed when lying down, when there is the least stress on the joints. Motion palpation, a hand technique the chiropractor uses to determine if your vertebrae are moving normally. Chiropractors take many factors—including size, weight, and muscle structure—into consideration when deciding on which adjustment to make. Sometimes, ice, electrical stimulation, or myofassial release is used prior to a spinal manipulation in order to relax the muscles. Adjustments usually feel good immediately. Dr. Clemons has found that it is impossible to predict who will like being adjusted. Patients who workout regularly and who enjoy massages usually like being adjusted. Most everyone likes the result of being adjusted. The important thing for a patient to keep in mind is to remain relaxed, because stiffening up may impede the adjustment process. Popping sounds are sometimes heard during adjustments; these are usually nitrogen being converted to gas in the increased joint space createds by the adjustment. Adjustments can leave you with a greater sense of well-being, calm, and most importantly, on the road to a life without pain. Following an adjustment, some patients experience mild aching or soreness in their spinal joints or muscles, which can usually be relieved by using ice.